This survey has now closed. We are constantly consulting with our citizens, so please keep an eye out for future ways to get involved. What does “Quality of Life” mean to Salford people, and how can it be measured? 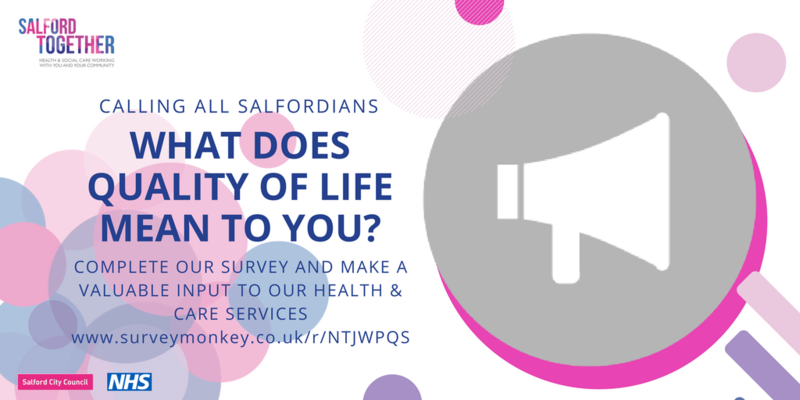 We want to know what “Quality of Life” means to Salford people and have designed a survey to collect information to help us understand what it means to you. We couldn’t complete this quality of life work without your valuable input, please could you take a few minutes to fill in our short five-minute survey. Haelo are working with “Salford Together” on how to measure quality of life. Salford Together is a partnership across agencies in Salford that are working to improve health and care services. As part of this there are many ongoing programmes to improve services and implement new services, and we are trying to evaluate the impact of these programmes. In order to evaluate these programmes, we are aiming to generate some questions that we can ask Salford people when they come into contact with these new services that will help us find out if we’re improving people’s quality of life. Complete our short survey online.